This is Part 1 of my epic four-part series, taking a deep-dive into SaaS metrics. I’ll be covering KPIs for Growth, Marketing, Sales and Customer Success, and offering formulae, explanations and expert opinions for 50 essential metrics. Click to read the complete post, or download it as a PDF to save for later. Growth metrics are designed to analyse the “momentum” of your business as a whole: your ability to grow, and keep growing. Think of them like the heartbeat, blood pressure and temperature of your company: the core indicators that reveal the health of your SaaS business at its most fundamental level. By combining together elements of sales, marketing and customer success, these metrics provide a clear indication of your overall performance, in a handful of key figures (it’s for that reason they often form a crucial part of any investor’s due diligence). Understand how your business is developing, and where performance can be improved. Create a dashboard of at-a-glance SaaS metrics to stay on top of your company’s health and performance. Communicate the value of your growing business to would-be investors. SaaS businesses are subscription-based, and the recurring nature of this payment model makes it relatively easy to track and forecast revenue, in a way that other business models struggle to do. That’s where MRR comes in: we can work out the amount of predictable revenue generated by our customers each month, known as Monthly Recurring Revenue. MRR is essential for understanding the growth of your business, and with a good handle on customer acquisition and churn rates (which I’ll cover below), we can even use it to extrapolate to the future, and predict future revenue. The basic formula for MRR is pretty simple: for any given month (period t), simply sum up the recurring revenue generated by that month’s customers to arrive at your MRR figure. Most SaaS businesses generate the majority of their revenue from monthly subscriptions, making MRR the clearest indicator of revenue generation. However some businesses deal primarily in yearly contracts, making ARR an easier and clearer metric to use. As a subscription-based business, your growth depends on new customer acquisition, and crucially, minimising the loss of your existing customers. Customer churn (often referred to as “Logo Churn”) measures the rate at which your existing customers cancel their subscription to your service. It’s important to track both monthly and annual customer churn rates, for one very simple reason: reasonable sounding monthly churn can quickly turn into crippling annual churn. For example, I’ve seen multiple estimates for a target annual churn of 5–7% — using the formula below, that translates to roughly 0.5% monthly churn, or a loss of 1 customer in every 200. Each month, there’s likely to be a portion of your customer base that is currently unable to churn: typically because they’re still bound by their contract (let’s say you offer a monthly rolling contract with a 3-month minimum committment). Similarly, measuring churn isn’t a goal in its own right: we want to understand the why behind churn, and fix it. By grouping together customers with similar attributes (such as month joined, or the length of time they’ve been a customer), we can create churn cohorts to try and identify the triggers that cause high churn. Revenue churn (also referred to as “MRR churn rate”) is used to look at the rate at which monthly recurring revenue (MRR) is lost, as a result of lost customers and downgraded subscriptions. The examples above are pretty simple: 5% customer churn resulted in 5% revenue churn. In reality though, different pricing packages, and additional seats, users and storage, can make churn calculations much more complicated. For example, imagine we were able to upsell 4 of our current customers to a higher priced package, for an additional $250/month. Bookings records the total value of all new deals obtained over a time period. Crucially (and unlike MRR), Bookings figures make no distinction between up-front and recurring payments. For example, if a customer purchased a year’s subscription for $24,000, that month’s bookings figure would be $24,000, but the month’s MRR would be $2,000 ($24,000 / 12). As a general rule, tracking Bookings is a useful way of measuring cashflow, but MRR is more helpful for measuring revenue growth over time. The MRR Growth Rate is extremely useful for measuring the improvement of your revenue generation over time. A steady month-on-month MRR Growth Rate is indicative of rapid, exponential growth, as it requires more revenue each and every month to sustain the same growth rate. MRR Growth Rate is useful, but it can be misleading. True exponential growth is extremely rare, and in the early days of a SaaS startup (when your revenue generation is low in absolute terms), reporting on this figure can conflate true exponential growth with step improvements to your revenue: after all, it’s easy to double your MRR for several months when your starting point is $100. New MRR is revenue gained from new subscriptions. Expansion MRR is revenue gained as a result of successful upselling and cross-selling. Churned MRR is revenue lost as a result of customers cancelling their subscription. Contraction MRR is revenue lost as a result of customers downgrading their subscription. Reactivation MRR is revenue generated by a previously churned customer returning to a paid subscription. Using this information, we can then calculate Net New MRR: the additional MRR generated, after we’ve taken into account MRR lost to churn. The SaaS Quick Ratio is designed to compare your revenue growth over a particular time period (as shown by New MRR + Expansion MRR) with your revenue shrinkage over the same timeframe (as shown by Churned MRR + Contraction MRR). Devised by Social Capital founder Mamoon Hamid, it creates a simple ratio of growth to churn, and provides a clear indicator of the health of your revenue growth, and not just its speed. Though the overall growth rate is the same, the underlying health of these businesses is very, very different. The last company is having to generate $4,000 of new revenue, each and every month, just to keep its head above water. If you’re looking for something to aim for, analysis of real-world SaaS Quick Ratios showed that successful, fast growing SaaS companies sustain an average Quick Ratio of 3.9. Burn Rate refers to the rate at which companies use their cash supply over time. The Gross Burn Rate refers to the amount of money a company spends in a month. The Net Burn Rate refers to the amount the company loses in a month (Gross Burn Rate — Revenue). 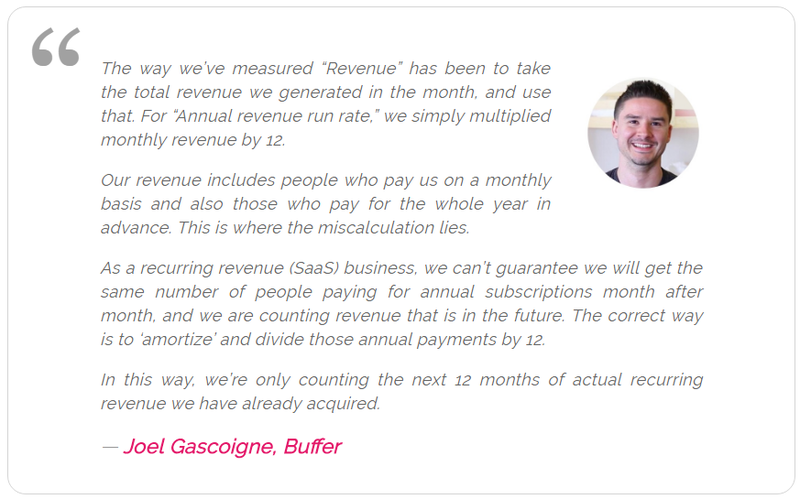 If earned revenue is greater than the amount spent in a month, Net Burn will be negative. Burn Rate is particularly important to investors because it provides an indication of when a startup should look to raise its next round of funding. For example, with a Net Burn Rate of $200,000, and $2 million in the bank, the company has 10-months of cash remaining (often referred to as the company’s “cash runway”). If that burn rate increased to $400,000, the runway would be reduced to 5-months. Zero Cash Date (ZCD) is the predicted date your startup runs out of cash, as a result of your current burn rate, and assuming no new revenue generation. Your ZCD provides an indication of when new funding should be sought, and as your startup becomes cashflow positive and builds up its cash reserves, your ZCD should move further and further into the future. Third-party web fees (like CDNs or licensing for products embedded in the application). Working out your COGS is an important part of calculating your Gross Margin: the percentage of your revenue left over after the cost of servicing that revenue (i.e. the costs of delivering the service that generated the revenue) is taken into account. For example, if a company generated $50,000 of revenue over a particular period, and had to spend $7,000 on hosting and $3,000 on customer support over that same period, their Gross Margin on that revenue would be 80%, or $40,000. High gross margins are a hallmark of software-as-a-service businesses, and the higher your gross margin, the more revenue you have available to invest back into growth. Up next: The Complete Guide to SaaS Marketing Metrics. Can’t wait that long? Click to read the complete post, or download it as a PDF to save for later. I help SaaS companies grow with content marketing. I also drink Scotch. Sometimes together. Cutting-edge strategies and advice for SaaS founders looking to scale their business.